Direct intramyocardial therapies aimed at treating myocardial regions affected by severe ischemia may benefit from CMR-guided interventional procedures. Although interventional MR approaches using active devices are considered to be the method of choice, potential tissue heating and altered mechanical properties are some of their limitations. Methods that have the capacity to visualize MR-compatible passive devices may overcome many of these obstacles. Recently, an off-resonance-based real-time positive contrast method (FLAPS) was used to visualize the passage of an intramyocardial needle (PIN) through the aorta and into the heart of swine [1, 2]. We envision this procedure may benefit from computer assisted strategies that track the needle's location throughout the MR procedure. However, the feasibility of real-time automated tracking of a PIN has not been established. To test the feasibility of automated off-resonance MRI-based tracking of a passive intramyocardial needle in a realistic phantom of the thoracic aorta. A 7 F steerable catheter (Boston Scientific, USA), typically used in conjunction with cell therapies, was fitted with a MR compatible, 22-gauge, 15 mm (full length) and 8 mm (exposed length) needle (Lufkin, E-Z-EM, USA). 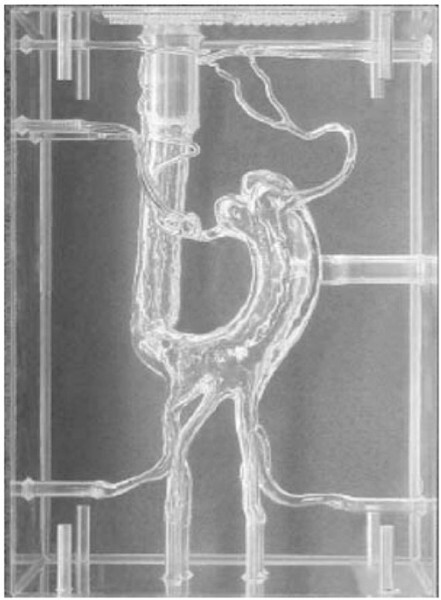 A realistic phantom of the thoracic aorta (Elastrat; Switzerland) (Figure 1) was filled with water doped to mimic the relaxation characteristics of blood and placed in a 1.5 Tesla Siemens Sonata scanner. The 7 F steerable catheter was advanced through the phantom while continuous MR imaging was performed using a dephased FLAPS (dFLAPS) sequence  capable of visualizing the needle tip. Two overlapping, orthogonal slices acquired in an interleaved manner were used to extract the location of the needle. Imaging parameters were: 30 × 30 cm field-of-view, 10 cm slice thickness, 192 × 192 matrix, TR/TE = 2.8/1.4 ms, frame rate ~2 Hz. A photograph of the thoracic aorta phantom used in the needle tracking studies. 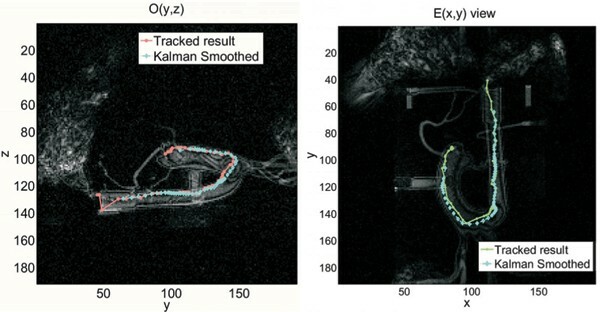 Two orthogonal MR images, O(x, y) and E(z, y), of the phantom were used simultaneously to track the needle tip with an image processing algorithm. The algorithm took input of the initial location of the needle (regions of positive contrast) from the first frames and detected the needle in subsequent frames using a template method. The template methodology used information from the previous frame and was flexible, allowing for rotation and scaling to adapt to the dynamic MR footprint of the needle. A real-time filter was used to smooth the data and all observations were combined to improve the accuracy of the needle's position. Figure 2 shows the results obtained from needle tracking based on bi-plane dFLAPS images using a deformable template algorithm. Both the point-based and smoothed trajectories of the needle movement within the thoracic phantom are clearly visualized and are shown superimposed on the orthogonal MR images. Results from the automated needle tracking studies. The two orthogonal views, (O(y, z)) and E(x, y)) of the thoracic phantom, captured with DFLAPS MRI and the superimposed passage of the needle (point-based and Kallman smoothed trajectories) are shown. The horizontal and vertical positions of the respective views (units in mm) provide 2D co-ordinates of the needle at a given point in time. Mutually shared information between the views gives the co-ordinates of the needle in 3D space. The feasibility to track a PIN with off-resonance positive contrast was demonstrated in a phantom of an aorta. Although the image processing was performed retrospectively in this study, given the real-time capacity of the template tracking method, it should be readily adaptable for prospective guidance. Future studies need to extend this work to in vivo conditions in order to assess the capacity of the technique within the heart and aorta.